My husband decided a while back that we needed to all start getting up with him in the morning (at WAY too early-thirty) and go for a walk, eat breakfast together, and do some Bible reading. At that early hour, though, we felt like we were floundering a bit on the Bible portion of that routine. And then then I had the opportunity to review Living a Mighty Faith by Angus Buchan. This has been a great answer for us. 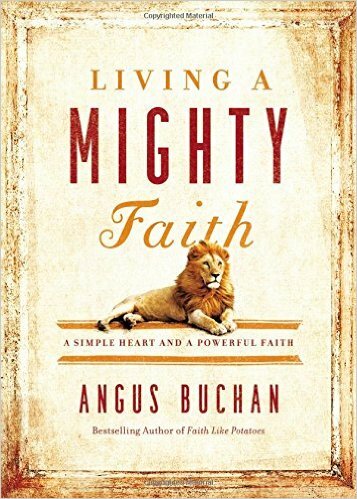 Angus Buchan is the man behind Faith Like Potatoes. If you haven't seen the movie version, you need to do so. Fantastic story. He's a very real, farmer/evangelist, and reading his devotionals has been a wonderful experience. He isn't out there spouting lofty, complicated words. WHAT ARE the characteristics of a hero? Young people especially look for a hero who is a winner, someone who is successful in his or her field. But a true hero should be humble and meek, since meekness is controlled strength. He must know where he's going and be prepared to get there whatever the cost. He must also be holy -- honest and reliable; sincere and dependable. He is an overcomer; one who rises to the challenge; and one who is fearless, irrespective of the mountain before him. The book itself just feels hefty, with quality pages. Love it.